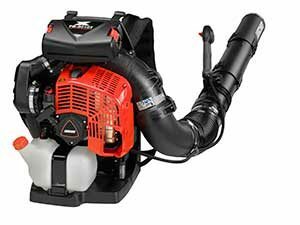 Echo introduced two new blowers for 2019—the PB-8010 and PB-2620. The PB-8010 backpack blower includes a new 79.9cc engine, which delivers a performance of 1,071 cubic feet per minute (CFM) and 211 miles per hour (mph), with 44 newtons of force, according to the American National Standards Institute (ANSI) B175.2 standard. The blower features 3.6-inch diameter tubes with a wear ring on the end. The PB-8010 also comes with a carbon fiber plastic frame and fan case. The new technology can cut 1.9 pounds and weighs 24.5 pounds. Other features include an oversized pleated paper main filter and foam prefilter for use in high-dust environments, tool-less latches for easy in-field maintenance, an 83.8-ounce fuel tank and a padded backrest and backpack straps. The vented backpack frame draws air across the user’s back, and a block-off plate is included for use in cooler weather, according to Echo. The product is available with either a tube-mounted throttle (PB-8010T) or a hip-mounted throttle (PB-8010H) for an MSRP of $599.99. Echo’s PB-2620 provides a blowing performance of 456 CFM and 172 mph, with 15.8 newtons of force, according to ANSI B175.2. It includes chrome cylinder plating; a pleated paper main filter and foam prefilter with tool-less access; hot restartability; a 20.3-ounce fuel tank; a round-end pipe (with a wear ring); and a flared-end pipe. A rubber main handle, a secondary handle and variable locking cruise offer operator comfort, Echo said. The PB-2620 sells for an MSRP of $199.99. Both models will be showcased at GIE+EXPO and will be available at Echo dealers starting this fall. The blowers come with Echo’s two-year commercial/five-year consumer warranty.